Actress Priyanka Chopra in USA Las angels for SAG Awards function. Priyanka Chopra Shows her curves in the pink lace mesh gown. Actress Priyanka Chopra flaunts Off-Shoulder Pink color Lace Gown in the US SAG Awards function. Pink Color Lace Mesh gown for the girls. The gown looks so awesome. 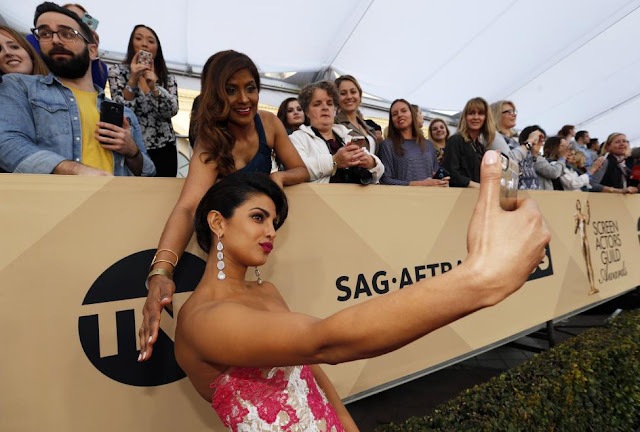 Actress Priyanka Shopra takes the selfie with one of her fan in the USA SAG awards function. Priyanka chopra in the USA Sag awards function she wears the off shoulder gown dress to attract all the members in the function. There is no doubt that she is the show catcher in the function. Bollywood Actress Priyanka Chopra in the SAG awards function in the Losangels, USA. The annual award show took place at the Shrine Auditorium and Expo Hall on Saturday where Actress Priyanka Chopra bollywood actress, 33, was a presenter and she worn the latest modern artworked pink color Gown. Actress Priyanka chopra signs an autograph to her fan in the SAG function awards.